Thanks to Adventurethon for sharing this article. 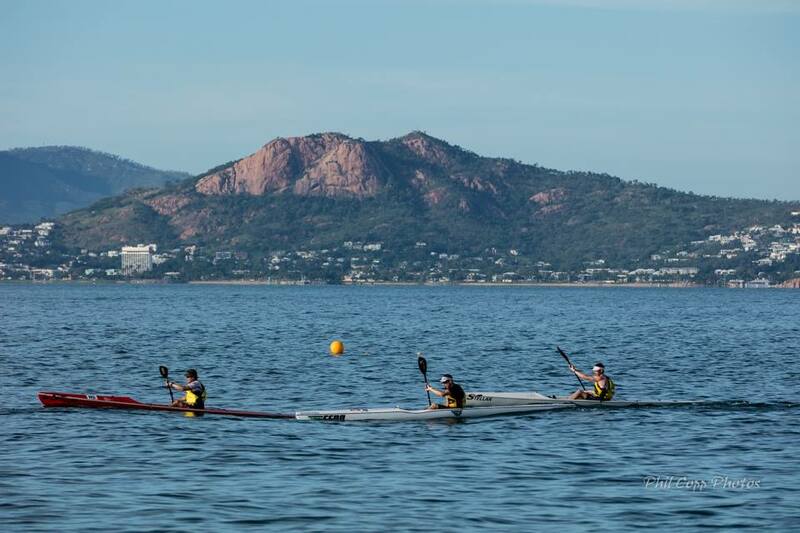 Adventurethon Magnetic Island marked the 21st Adventurethon event last weekend with higher than expected eager contenders meaning a sell-out event before regos closed. 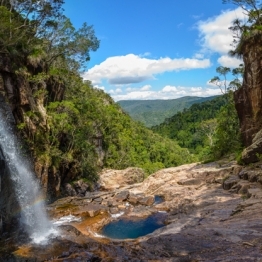 In the two weeks leading up to the event, the ‘dome’ over Townsville lifted and we experienced heavy rainfall, changing the trails from very dry to ample water crossings and flowing creeks. As we prepared for the wet conditions, it was wonderful to wake up on Friday morning with sunshine and clearing skies. 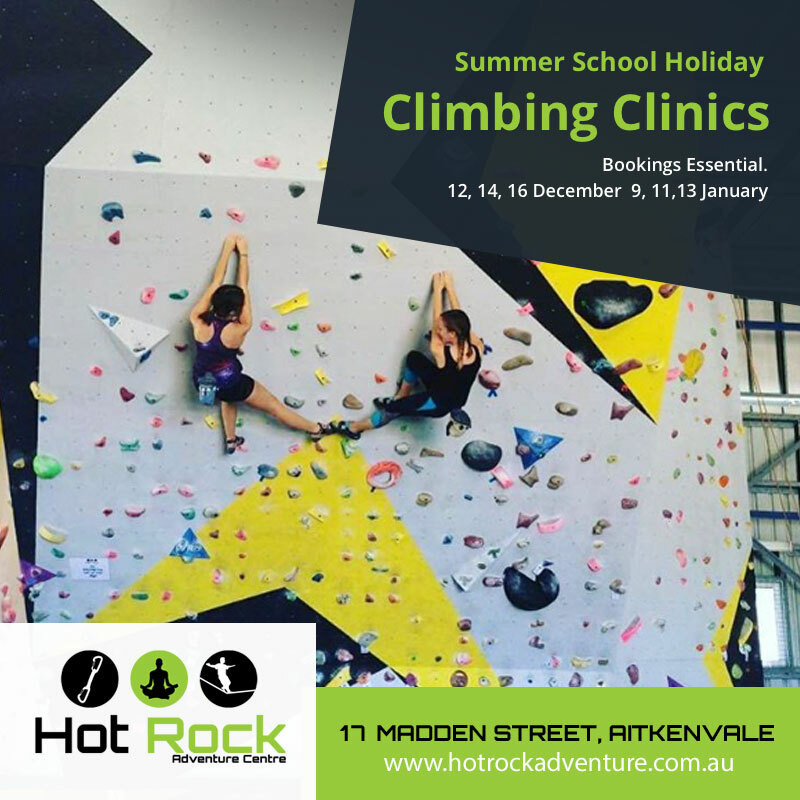 Although this meant a much higher humidity level than previously expected – an extra challenge for keen adventurers! As the sun rose Saturday morning and competitors started arriving, you could tell it was going to be a great day. Bikes and boats were checked in, race bibs sorted and last minute toilet stops made. 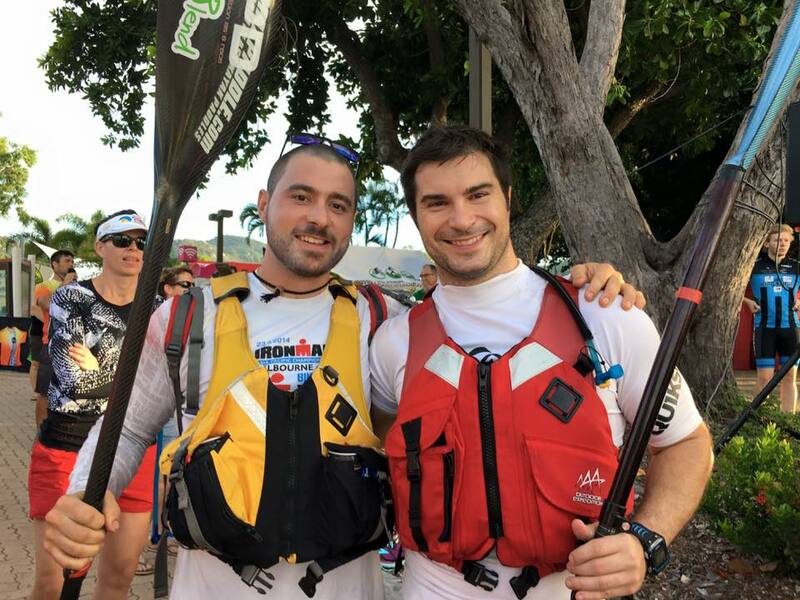 All eyes were on the two Sams (Sam Stedman and Sam Clark) as they prepared to battle it out for the top spot in the BNG Sports Ultra Adventurethon. We looked forward to the challenge and the unknown possibilities from other Ultra competitors. 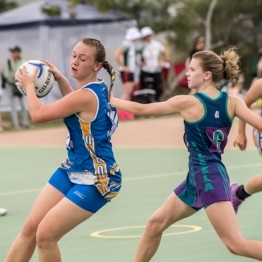 With many athletes traveling from out of Queensland, the weather was sure to play a factor in the day’s events. And we couldn’t wait to see how it all unfolded. The longer the day went on the more the heat became a challenge so many competitors were more than impressed and appreciative (as were we!) that the Maggie locals got behind them, with at least seven different supporters hosing them with water along the way to keep them cool. The wind had almost completely dropped off – even the Adventurethon flags weren’t moving. 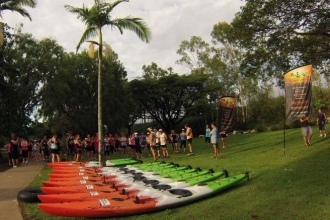 This made for a hot, slow paddle for many competitors, and – as the heat increased – things were about to get testy. 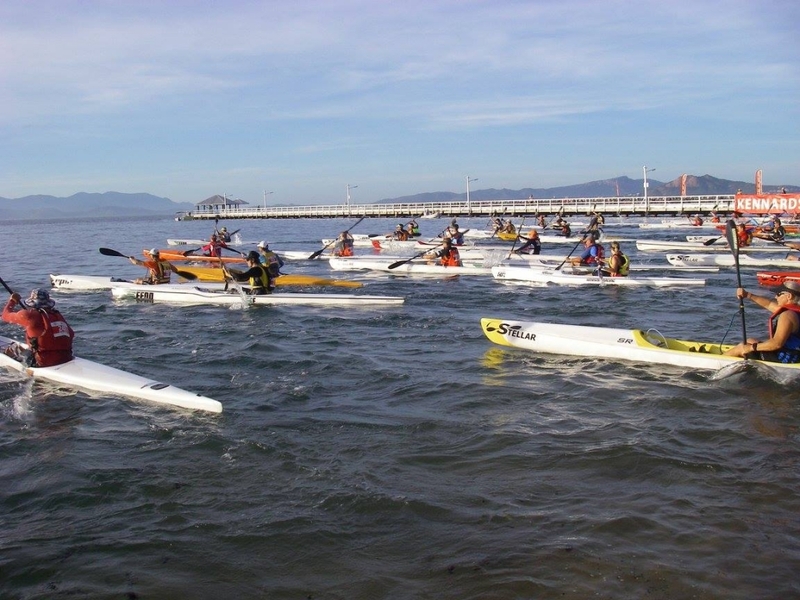 The Ultra paddlers heading around to Radical Bay enjoyed the small bumps, but all in all there was not much assistance for paddlers. A massive congratulations to New Zealand’s Sam Clark who was the first Ultra individual competitor to cross the line in 05:55:23, edging out local Adventurethoner Sam Stedman by 12 minutes (6:07:49). 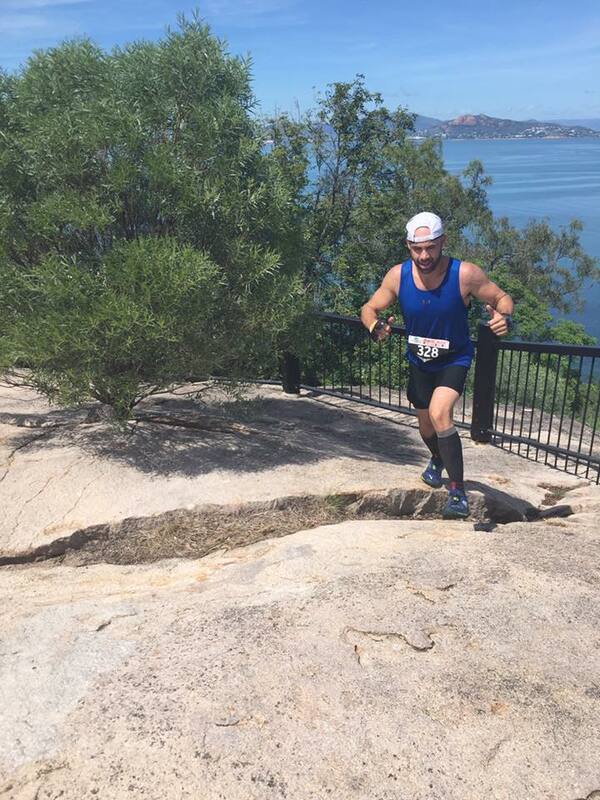 Fellow Townsville local Andrew Everingham crossed the line third in the elite males with a time of 7:16:35. The elite guys had as many challenges along the way as everyone else, with both Sams having tyre issues and Sam Clark featuring in an impressive bike stack on the pipeline trail, which saw him come off and his bike come flying over him. The open male category was dominated by out-of-towners. 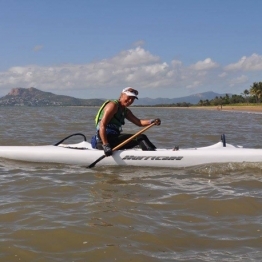 First paddler in off the water in the entire Ultra category was Matt O’Garey from Coffs Harbour, NSW. Matt ended up finishing first in the Open Male category (7:57:33) overcoming the heat and humidity of the north. Dan Teasedale from south east Queensland (9:03:57) came in second and Kevin Kelly, who joined us from Western Australia, finished third (9:43:47). Kevin celebrated his 21st wedding anniversary over the weekend, making our 21st event celebrations just that little more exciting. 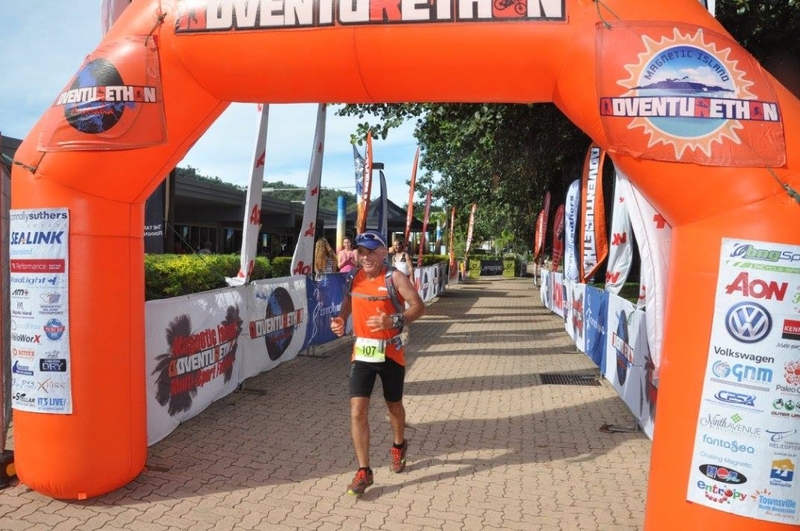 Special mention to local Luke Miles, who had a DNF at Adventurethon Magnetic Island in 2015. He was determined not to let it ‘beat him again’. And so we saw a very happy Luke crossing the line at the end of the day. Well done. Special mention also to Craig McPhan, who struggled with the heat of the day and ended up stopping early with swollen feet and tingly hands. After recently competing in the Coast to Coast in New Zealand, he says the heat really took it out of him. 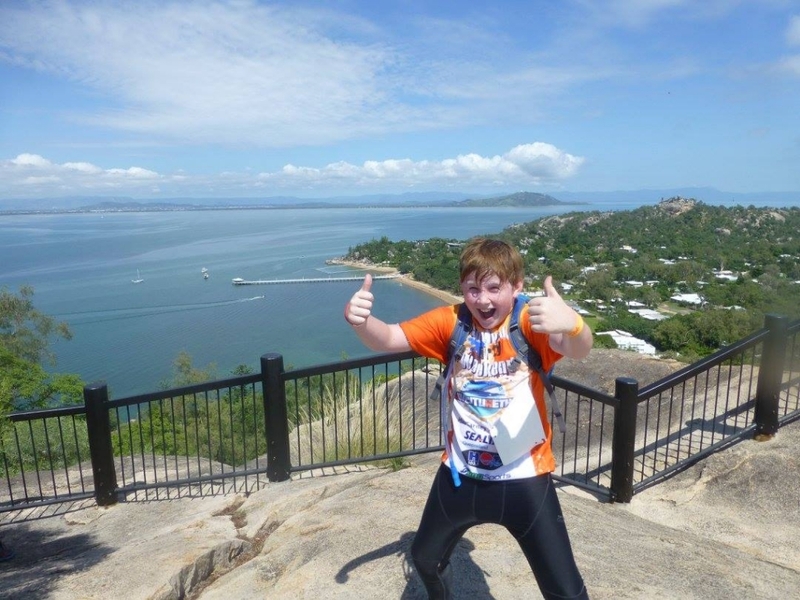 He assures us he will be back again in Pallarenda for the Townsville Adventurethon later this year (which enjoys much milder temperature conditions). 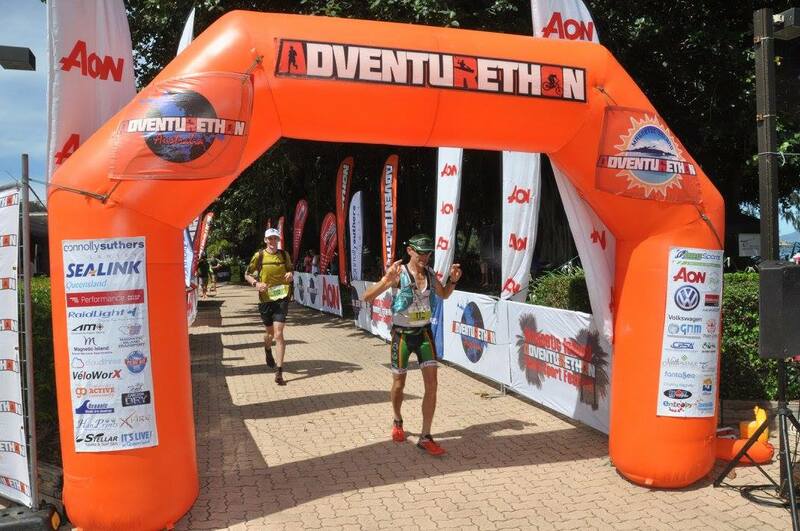 Peter Verrydt finished 1st in the Male master 40+ category (7:26:41). Robert Smythe had a good day out, and as always mastered the course with a smile. He finished first in the Grand masters Category (8:58:20). Stevo Connell wasn’t sure how he would go in the BNG Sports Ultra. He was determined that he ‘just wanted to finish’. And finish he did, coming first in the Clydesdale category in 9:31:29. 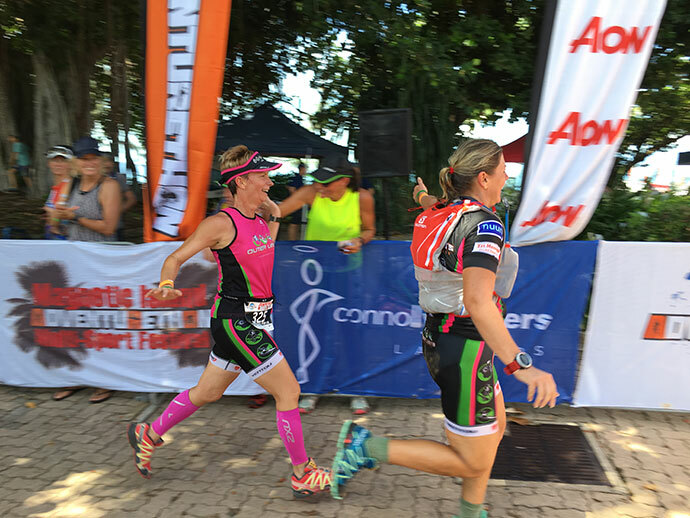 We love seeing the women competing in the Ultra and with four women in the category, it was looking to be an interesting race. 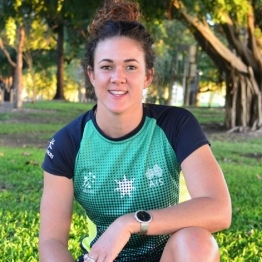 Fiona Dowling, visiting New Zealand athlete, did not have a trouble-free lead into the race, after arriving on Wednesday to discover her bike box was missing and contemplating Plan B. All ended up OK though, and Fiona’s bike box was found and delivered to her on the island. Fiona was the first Female Open Ultra to finish the race (6:59:43). 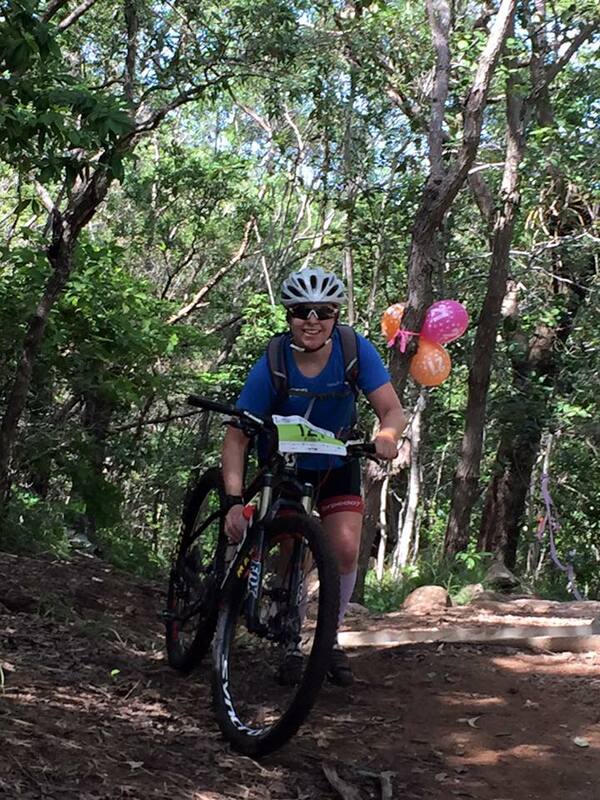 Local Maggie Island female, Laura Dunstan, finished second (7:47:21). And Lia Johnson crossed the line third (9:09:33). The team categories were full of impressive athletes, all out there to do the best they could in their individual leg of the race. Team Adventure Angels was the first Ultra team (and first Ultras) to cross the finish line in (5:42:19). Top Brand Not So Young finished second (6:12:10). Top Brand Celebs, featuring Caro (from Caro and Kingy Block fame) were pretty quick around the course also, finishing third in (6:39:57). The VW Enduro competitors headed out on a 13km paddle in the protected waters off Picnic Bay, but with the massive drop in wind overnight, even the Enduro paddlers were slower than usual due to the lack of any kind of current. 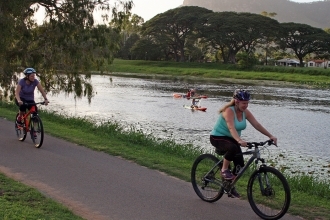 It was, however, a very spectator-friendly course, enabling friends and family to enjoy watching the paddlers through the whole effort. Ian Anderson got around the course in a very quick time (4:13:27. In fact both Ian and his wife Julia took top places on the podium in their events. Milford McArthur finished in (4:19:58). 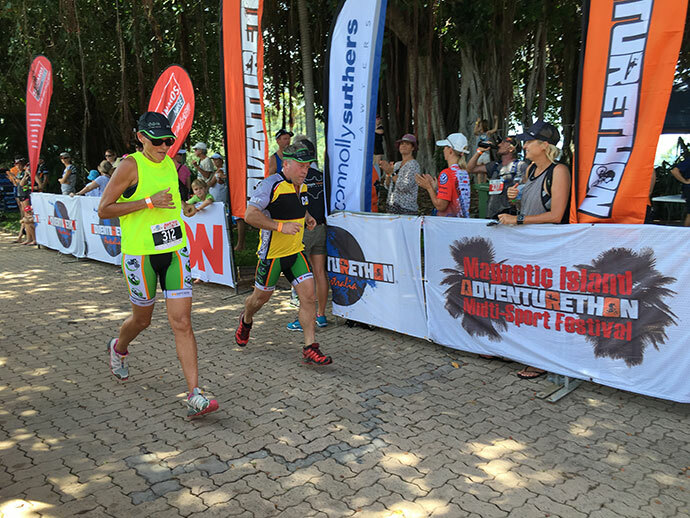 Herbert Kuskopf got around the course in (4:14:26) finishing first in the Male Masters Category. Paul Smith finished second (4:39:36) and Max Kadel finished third in (4:42:28). Max was pretty thrilled with his placing, saying ‘all that being dragged around the island on training runs and rides’ was worth it. 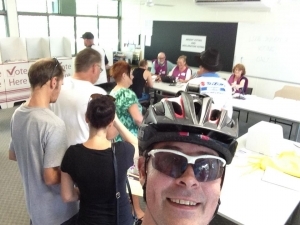 Special mention to David Nahrung who stopped to vote during his bike leg of the course. Greg Elwin finished first in (5:42:32), Geoff Stanton finished second (5:47:07) and Ray Francis finished third with a huge smile in (6:18:41). The open females posted some very good times with Carie Kelliher finishing first in (4:39:45), Brandi Watson second (5:02:53) and Karen Riley third (5:26:19). Kimberly Nagle (4:41:09) pushed herself and finished first in the Masters category with Daina Clark crossing second in (4:50:05) and Alison Whitehead third (4:51:06). 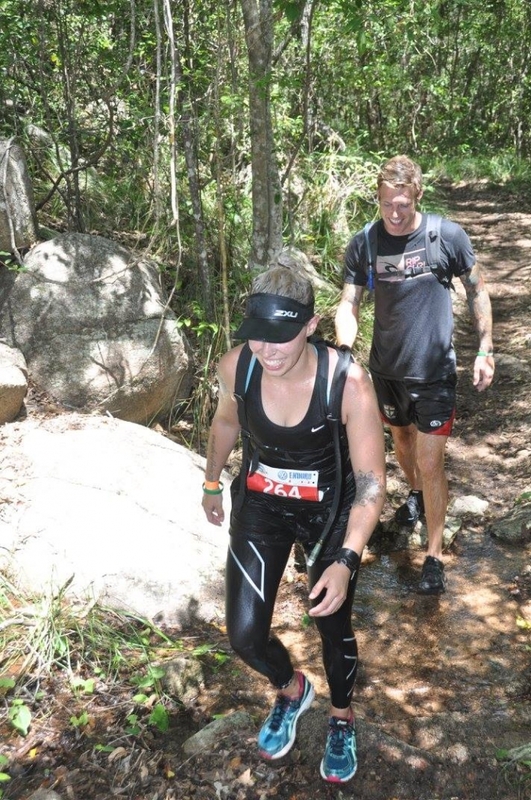 Patricia Nahrung completed the Grand masters category in (5:48:18). The teams showed how quick you can get around the course with each person focusing on their individual leg. Team RunNRide finished first in (3:40:40), Team Second to None finished second in (3:41:04) and Veloworx & Bodyshop 7 third in (4:03:46). Ben Cooper finished first in the Open Male category, beating even all the teams with (3:25:01). Daniel Lucas finished second (3:48:58) and Jason Peterkin finished third (4:08:50). Julia Anderson blitzed the women’s field, finishing first in (3:56:35). Robin Bode finished second (5:27:46) and Chloe Musgrove finished third in (6:44:14) and then went to work in the afternoon, while many other competitors were relaxing with a beer at Picnic Bay Pub. Jeff Pearce finished first in the Male Masters Category in (6:56:01). In the teams category, BNG Sports finished first in (3:30:59), Baguette finished in (3:35:27) and the E-Lemon-ators finished third in (3:41:02). 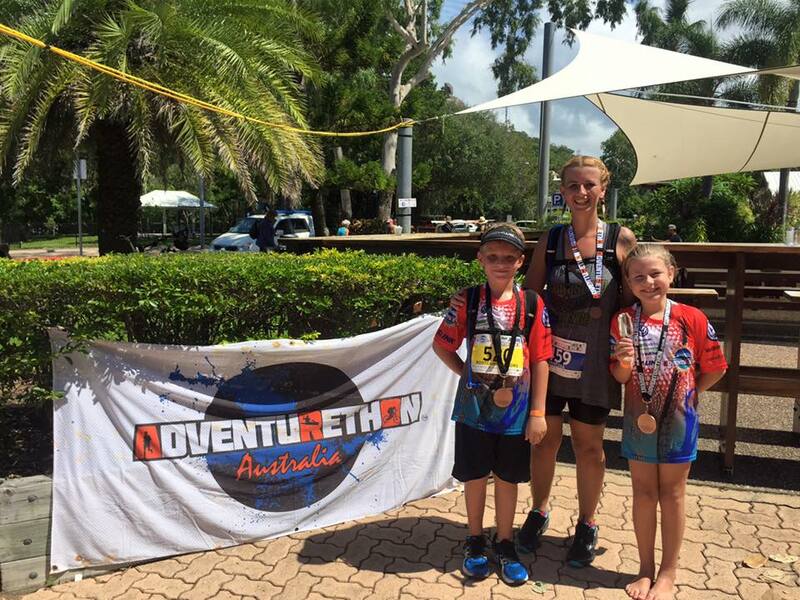 Sunday’s Connolly Suthers Taste of Adventurethon and Sealink Juniors were met with warm, sunny conditions and lots of nervous smiles. 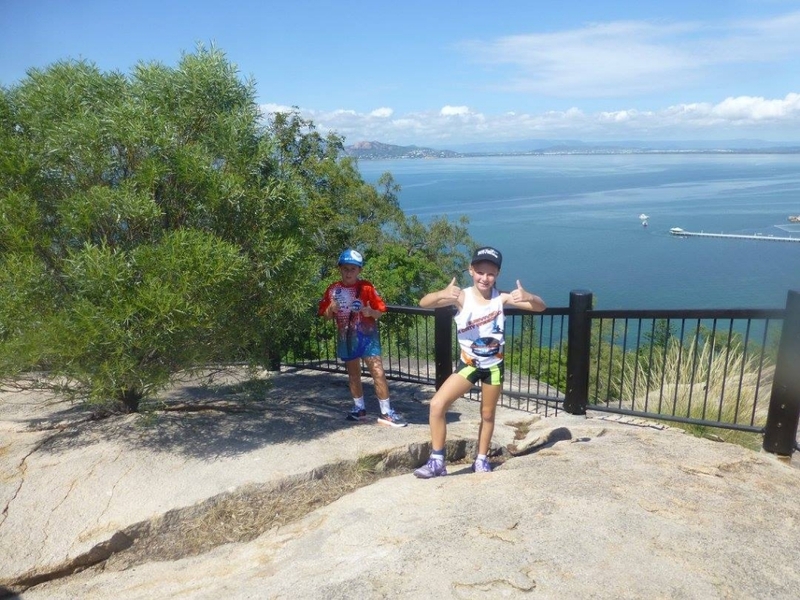 But by the end of the day the Taste and Junior competitors ended Adventurethon Magnetic Island 2016 with all smiles and large achievements; creating a fun and positive atmosphere as they battled through the heat to cross the finish line. Lincoln Taylor was first individual male to cross the line (01:07:05). Michael Pannach, who backed up from Saturday’s competition, to finish second with (01:16:21) and Shawn Huddy finished third with (01:17:54). Sarah Ruddell finished first in (01:12:37), Alana Nelson second in (01:12:37) and Annika Frossling third with (01:17:17). 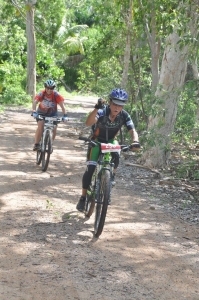 Team Posties finished first in (01:09:37), MIT (Magnetic Island Transport) second (01:34:19) and Maggie Bullants third (01:35:11). The Sealink Juniors are always amazing to watch, and this was no exception. 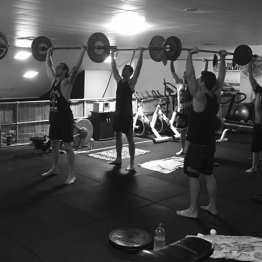 The kids push themselves to their limits and always manage to achieve awesome things. There were so many first-timers to Adventurethon and our regular awesome juniors, and we loved watching them all discover how wonderful it feels to be part of Adventurethon. Charlana Fourie finished first in (01:21:29), Tilleia Mitchell finished second (01:25:43) and Milana Anderson third (01:30:12). Michael Fourie smoked the junior field, finishing first in (01:07:57), Samuel Hinks (01:11:06) and Tom Doyle (01:16:44). Team Nobody Wants Us came first in (01:17:18), The Ring Ins (01:20:06) and Ninjas third with (01:29:11). Rebecca Nahrung finished first (01:11:10), Elliarna Mitchell second (01:13:35) and Imogen Blacklock finished third (01:19:42). Aiden Wheeler was first across the line in the 13–17yrs age category with (01:11:08) and Sullivan Blacklock finished second (01:23:25) and Bennett Jesberg (01:29:12). 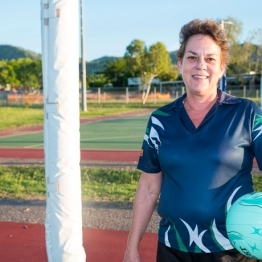 It was yet again another great successful event over at Magnetic Island and it would not have been possible without our volunteers. A big thank you to all volunteers on Saturday and Sunday for sacrificing their own time to help us out. Also a shout out to our photographers and videographers for coming out on the weekend to capture and shoot some great footage. 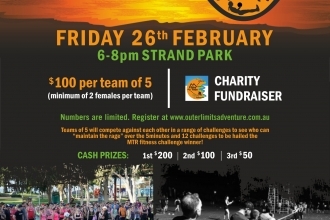 Adventurethon is an adrenaline charged multisport challenge incorporating paddling, mountain biking and off road (or trail) running. 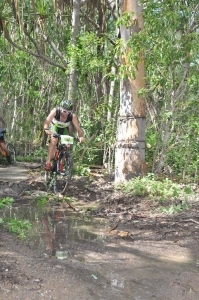 Similar to a triathlon format, each Adventurethon race is off road frequenting areas like national parklands, beaches and hiking trails to enjoy spectacular scenery and experience the outdoors.